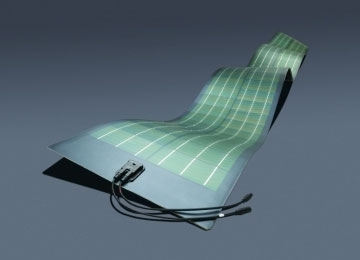 Overview Solar technology has reached its most convenient, lightweight form: the newly-engineered flexible solar panel. Silicon Solar is the proud carrier of over 50 modules of flexible solar panels, offered in a variety of sizes. Through recent developments, Silicon Solar has provided ways of listing thin, light weight, flexible solar panels allowing for multiple applications to now be solar accessible that never were before. Thin Film solar cells and panels now allow for several types of application to be introduced into the market including solar backpacks, solar thin film clothing and athletic apparel. We at Silicon Solar have taken these methods to the extreme and receive requests from customers who give us incentive and constructive feedback on developing new ways of utilizing this technology not only for them, but for you as well. Each flexible solar panel can be rolled up to 2 inches in diameter, making the paper thin solar cell one of the most durable and long lasting solar modules on the market. Thin-film flexible photovoltaics are paving the way to low-cost electricity. Organic, inorganic and organic–inorganic solar cells are deposited over flexible substrates by high-throughput (often roll-to-roll printing) technologies to afford lightweight, economic solar modules that can be integrated into, not installed on, various surfaces. Current conversion efficiencies under standard conditions are in the 3–15 % range, but in real applications the overall productivity is high. These new photovoltaic technologies are ready to provide cheap, clean electricity to the 2 billion people who lack access to the grid as well as to energy-eager companies and families in the developed world facing the increasing costs of electricity generated using fossil fuel resources. This Review focuses on recent achievements in the area of flexible solar cells, highlights the principles behind the main technologies, and discusses future challenges in this area. Thin-film flexible solar panels have already found their place in many portable electronic devices. Solar power is now trying to use the technology to ease rooftop solar installation by unveiling a line of flexible panels for commercial rooftops. The company makes these panels from a combination of copper, indium, gallium and selenium, which is placed on a flexible foil. The panels are lighter than glass-encased panels and can also be installed quicker than other technologies. SoloPower has already achieved 11 percent efficiency for its panels and uses a roll-to-roll electroplating process, which makes these panels highly cost-competitive with other solar manufacturers and technologies.